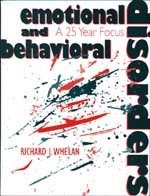 The book begins with a discussion of current practices in the education and management of students with emotional and behavioral disorders. Subsequent sections define and classify behaviors, identify styles of coping, show procedures for identification, and present educational interventions. You'll find chapters covering depression, dignity, interventions, instructional planning, and most importantly classroom practices.